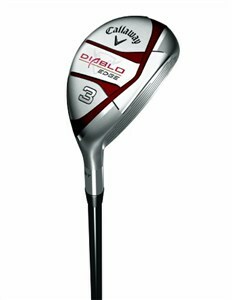 This Callaway Diablo Edge 4 Lady Hybrid is a good one to start with for you beginners. First, the hosel is offset. This will help the higher handicappers get the clubface closed more easily and avoid that nasty slice. Second, the club has a very low center of gravity. This makes it easier to swing down to the ball, especially in heavy rough, and it gets the ball up quickly and flying high towards the target. The last thing that I want to point out on this club may not make much difference to you, but you will notice quickly when your ball flies farther than your driver. What I'm talking about is the hybrid has Callaway's VFT. This stands for Variable Face Technology. This gives the face faster balls speeds with a sweet spot that covers the entire club face. This means that you don't have to hit the ball exactly in the middle of the clubface to still have the ball fly far as if you hit it right on the screws.